In a large mixing bowl, toss squash with butter and olive oil. Add 1 tablespoon of the spice mixture to the bowl and toss well to coat. Place squash on a sheet pan lined with parchment and bake for 40-45 minutes, tossing every 15 minutes, to allow for even browning. Sprinkle with 1½ teaspoons more of spice mixture. Toss gently to coat and serve hot. Note: This recipe makes enough spice mix for a few recipes, you can store the rest in a ziplock bag to make roasted veggies or baked fries. This recipe makes enough spice mix for a few recipes, you can store the rest in a ziplock bag to make roasted veggies or baked fries. 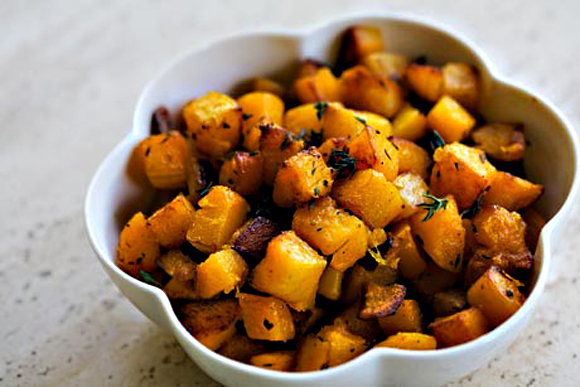 Adding Rutabaga to this dish is a delicious substitute for one of the squashes. Feel intimidated having to deal with cutting and peeling a squash? Here’s a video on how to make this easier. Basically you will want to pierce the squash with a knife all over and then place in the microwave for a few minutes. This softens the skin making it so much easier to peel.